I was surprised to see that Bill Guffey had chosen another US location for the September 2015 Virtual Paintout...Utah! I've only seen a bit of the bottom part of Utah in person and I remember loving the scenery. Wonderful landscapes, rock formations and colors. As always I wish I had time to look around more. 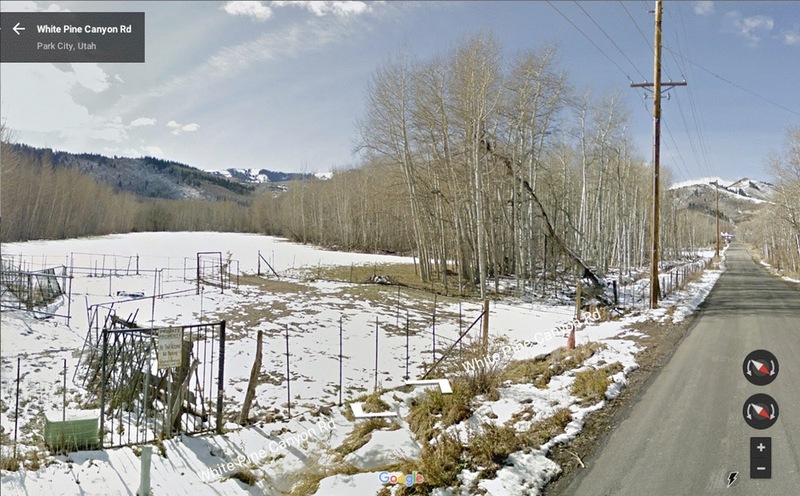 Looking around using Google Street View isn't the easiest thing to do but I always find amazing views. 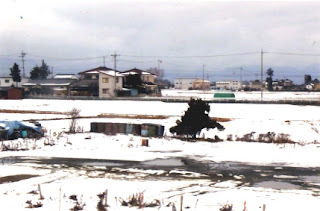 Of course I narrow good views down to something I'd like to paint and try to be representative of the area. 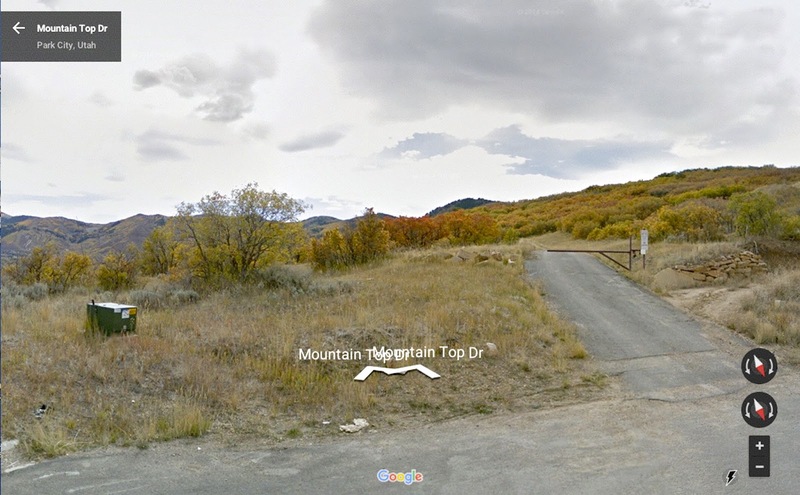 These two views are from around Park City and I wanted to find some snow. This month I wanted to try to incorporate some of the things I learned in the Chien Chung Wei workshop. Those lessons will take time to soak in I'm sure. I'm wondering if the October location will be in the US as well! In August I was fortunate to have the opportunity to take a workshop given by Chien Chung Wei, the amazing watercolor artist from Taiwan. Chien came to the United States after giving a workshop in Italy, then Canada. Next he was in Portland, Oregon, working his way down to Pasadena. From following Chien on Facebook I was getting a hint of what an exciting workshop it would be. 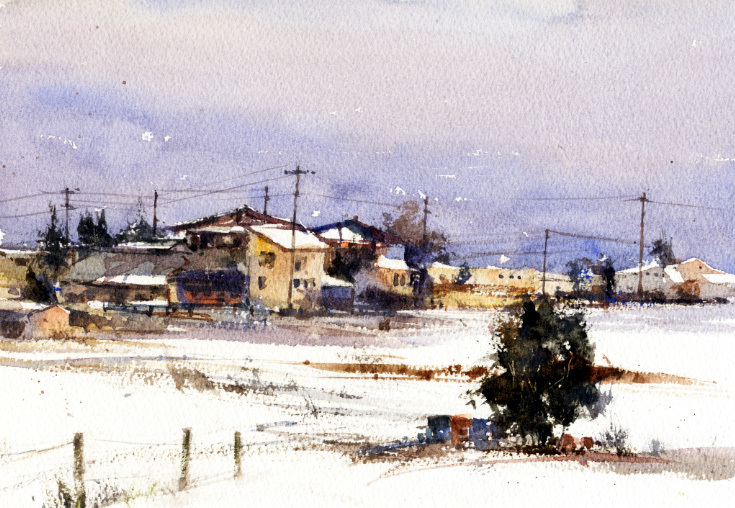 Chien has a school for watercolor study in Taiwan so he wanted to condense the three year course into three days for us! It's all about the "DNA of Beauty". He has ten foundation points of his DNA that we should learn and they should become a habit while we paint. Six points were "Yes" things to keep in mind (like "more detail in the focal point") and four were "No"s (like "no sameness or overdoing"). Chien's emphasis is on good composition, having the elements of size, shape, value, color, detail, balance, all working together. He also showed us how to fix bad brushstrokes. He would rewet part of a stroke and put lines through it using the ferrule of a small inexpensive brush. Chien also used the edges of a palette knife to add texture and abstract interest. I hadn't seen that kind of work done before on a watercolor piece. Opaque watercolors are also something Chien uses often. After watching Chien paint a snow scene we all tried the same scene. This was the only piece I painted in the workshop. At the end of the first day he handed out a postcard of one of his paintings to each of us and we were to paint it as an abstract as homework. 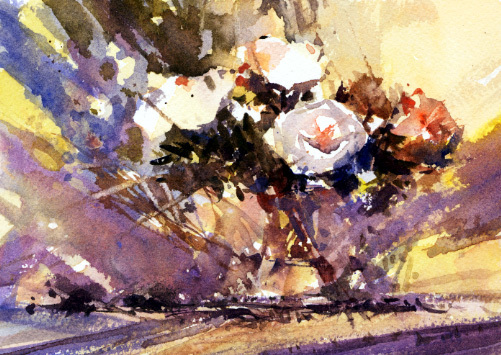 My postcard was an older piece of his, a floral still life. I tried the abstract but didn't take it far enough since it still looks like a vase of flowers. I should try it again. Chien emphasized the abstract quite often. He likes detail in a painting to be "loose detail", abstract. Also what isn't important in the piece should be abstract. Originally the workshop was to have some plein air painting outside but the weather was too hot. A very hot weekend. Chien asked us if we would like to see him paint more demos or if we would like to paint more. It was unanimous to watch Chien! He is a very animated, while thoughtful, person. What a treat, and I'm looking forward to taking another workshop from him sometime. 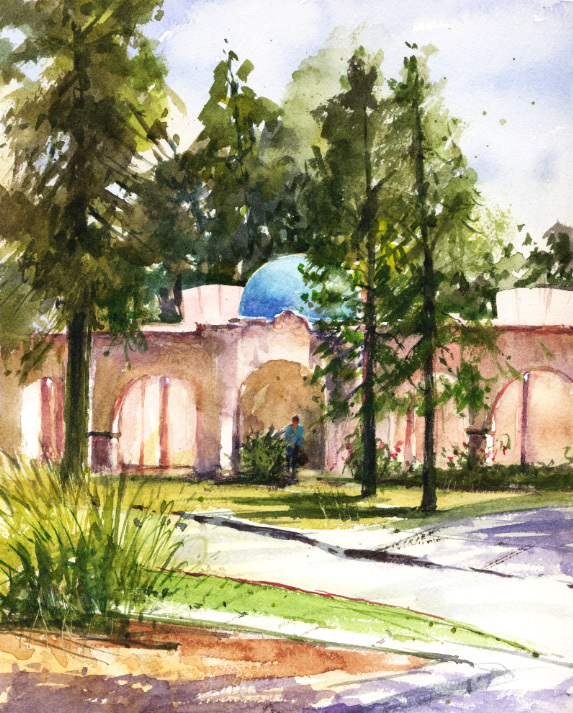 I've painted at our local library in South Pasadena several times now. 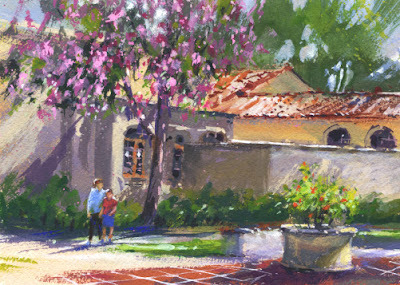 Time flies since it doesn't seem like a year ago I painted and posted South Pasadena Library. At a Saturday paint-out in August, I tried a gouache piece mostly because of the lovely pink crepe myrtle tree. (I see it can be "crape myrtle" too!) The cool pink of the flowers contrasted with the warm terra cotta roof tiles. 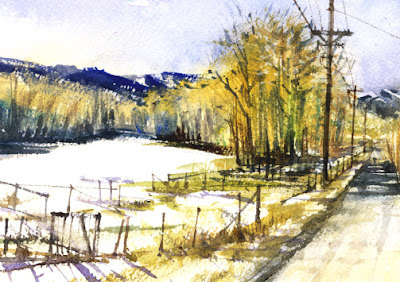 I recently took another watercolor workshop that I'll post about next I think. It seems we've been having very hot weather on paint-out days! Last month we had a few overcast days which is unusual for August in Southern California. On the Friday paint-out schedule was Art Center College of Design. The art school is located on a hill in Pasadena and we hoped for some views of the mountains and the city below. It was registration time so classes weren't in session and we met at the end of the parking lot. Since it was a dreary day we didn't have much of a view and the hillside was very overgrown which also blocked the view. 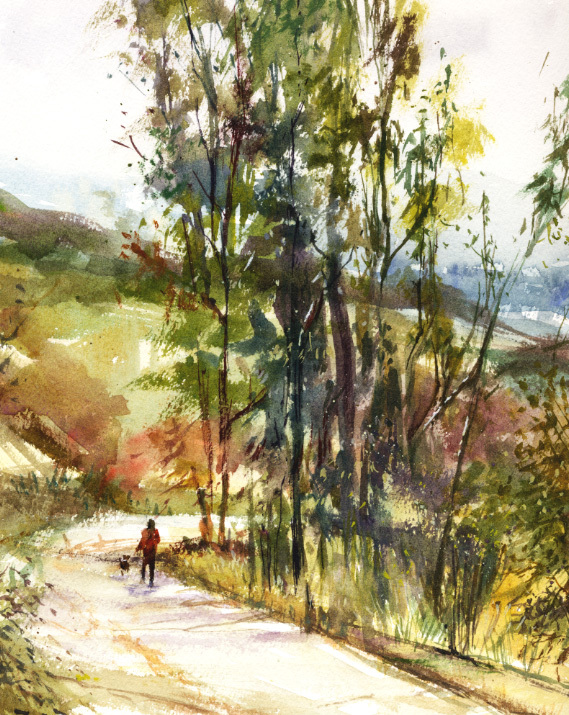 I tried a watercolor of the curving road down the back hillside with lots of trees and foliage. No structures this time so it was fun to try to make this view interesting. I usually see deer on the drive up to the campus. I was happy to see Caltech (The California Institute of Technology since 1920) on the paint-out schedule. At our Saturday morning paint-out two years ago I painted a watercolor and a gouache piece, and posted them in Caltech! It was ambitious to paint the two pieces in a few hours, which I used to try regularly. I haven't done that recently. 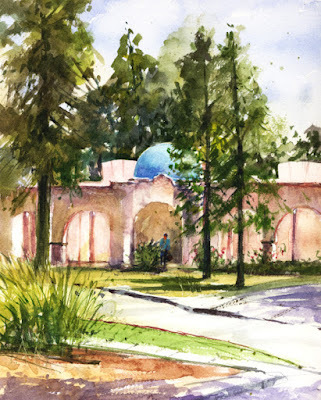 We were back at Caltech not too long ago but my attempt at a watercolor was not so good. I think maybe cropping it down to 5x7" will improve it! The architecture at Caltech is stunning. Very picturesque for plein air painters and we don't seem to have a problem being there on Saturday. One of my painting friends mentioned a building east of where we parked that had a blue-tiled dome. I knew about the two striking blue-tiled domes at the west entrance but not this one. I had to go check it out. While walking there I passed an old deco building with a lovely courtyard and tiled fountains. Such a nice place to paint. I had to try painting the dome building. It was surrounded by tall pines while across the street where I sat to paint, there was a beautiful "water-wise" patio area with Palo Verde trees, tables and chairs. It was fun to find out about a new-to-me area. And the art deco domed building at the edge of the campus is now the Electric Charging Station. It was back in July that we painted at the San Gabriel home of the Rose family. Originally from Bavaria, Leonard Rose came to California in 1860 and established his family in the San Gabriel Valley. He had many acres of orchards, a vineyard, he bred horses on his ranch named "Rosemead" (a city now), and he even became a state senator. His son Guy Rose became a top early California Impressionist painter. 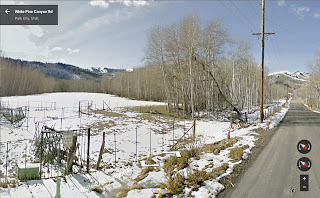 The original 1861 Rose home is still there, the oldest wood structure in the area. 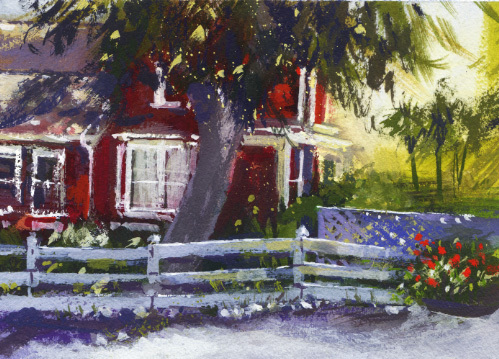 It was a very sunny morning when we met to paint the house but the bright sun and deep shadows were beautiful. There was one tree across the street that provided some shade for most of us and I tried a quick gouache piece before it got too hot. I kept imagining the suburban neighborhood and businesses with none of it there except for the red house. While we painted, several neighbors walked by and bicycled past mentioning the history of the landmark structure. Nice to hear how much it's appreciated! What a treat it was to see Joseph Zbukvic in Fallbrook, California again. He is here to teach a 5-day workshop that I didn't find out about soon enough this time to get a spot. I was in his Fallbrook workshop in 2013 and posted about that experience in two parts, Z Workshop! Part 1 with a link to Part 2. Luckily for me, Joseph was very generous and agreed to paint a piece as a fundraiser for the Fallbrook School of the Arts. I was able to get tickets for this sold out demonstration. After a full day of teaching, still with some jet lag, Joseph painted a gorgeous, full sheet view of Venice. It was wonderful to see him paint in person since I didn't get a coveted place in his workshop. I was also very happy to reconnect with some friends at the demo, and I met two new Facebook friends I had only known online. When Joseph finished the piece he auctioned it off himself to the audience there. The price kept going UP, finally ending at $4,000! 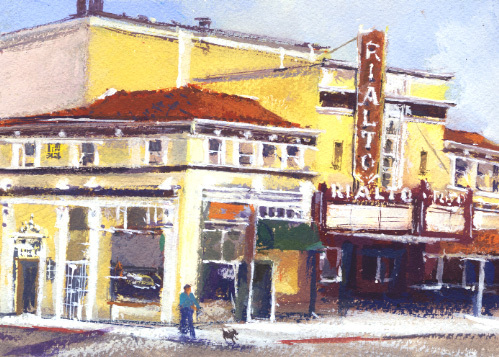 I was back at the Rialto Theatre in South Pasadena for my third paint-out there. The first was over two years ago, The Rialto. Opening in 1925, the theater is a landmark in the city but it's been in a state of disrepair for several years and closed to the public. The theater needed a new owner with some restoration plans. It was finally purchased this year by a redeveloper of older historic buildings in downtown Los Angeles. The plan is to turn it into an "entertainment venue" that screens old movies. We'll see. 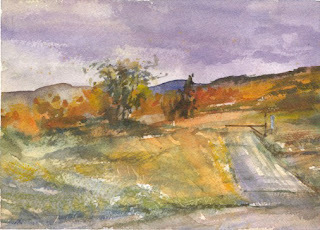 In the meantime, the local landmark is popular for plein air painters who have wanted to paint it before it was gone. There was some shade across the street so I tried a gouache piece. I think it's a difficult building and not very "picturesque". While we were painting, the first stage of renovating the interior had started. Workers were carrying barrel after barrel of debris out to a truck. It will be interesting to see what its new look will be while keeping some of the old.